Where is the demand for journalists? As the journalism profession and industry reconstructs itself, the demand still seems to be centered in the historic print and broadcast centers of New York and Los Angeles. 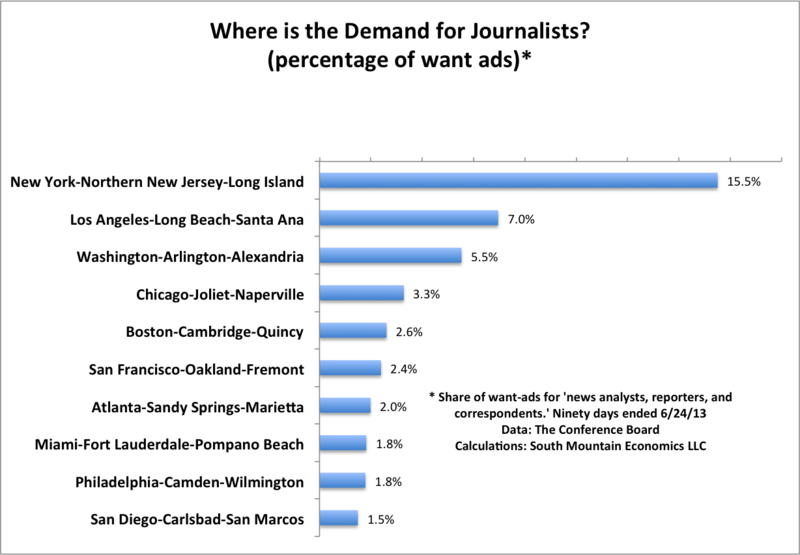 An analysis shows that roughly one quarter of want ads for ‘news analysts, reporters, and correspondents’ come out of the New York and Los Angeles metro areas The next highest source of journalist demand is Washington DC, with 5.5% of want ads for journalists. The top ten metro areas are shown below. I note that this analysis is preliminary and based on raw data. If there’s interest I can do another level of validation on the results.